we tried these, they came out pretty flat for some reason but then we didn't add any meat. We tried these tonight. I didn't have any broccoli at home so I made it without it and my family loved it!!! Thanks for the recipe!! I made these the other night. They were delicious. Thank you for sharing. Made these today and they were a huge hit, loved them… mouth is still watering! Thanks 🙂 I'm posting pictures on my blog tomorrow am, just fyi. Who knew this would be such a popular post? I'm really happy and pleased you are enjoying the recipe! Would love to hear if you made any changes, etc. Thank you! Pam – the recipe makes 12 full size muffin cups. I think this would be perfect as mini muffins. I'd cut the baking time by about a third, and then start checking for doneness every few minutes. Let me know how it turns out! just made these with chorizo instead of sausage – OMNOMNOM!!!! so delish. 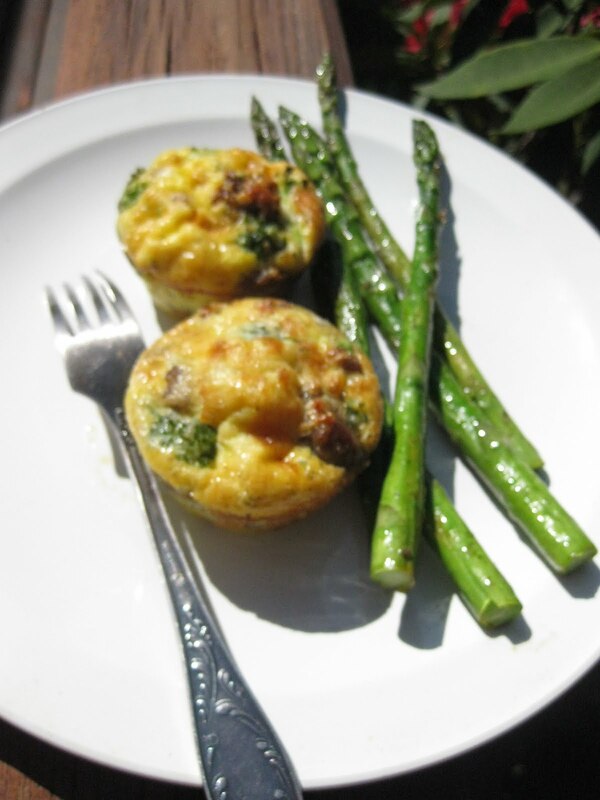 These look so good…my husband and I are taking a trip this weekend and need something to pack for breakfasts…do these reheat well? Or can you eat them cold?Can't wait to try them! I never quite expected so much love for these egg "cupcakes". So happy you all love them! Mine were all gone at brunch, so there were none to reheat. I think you can store them in air tight container in the refrigerator and reheat in the morning. They won't taste as good, but should be good! Anyone else had luck reheating them? yes, i've had good luck reheating them! i've had these for lunch every day for three days and they're still great. just store them in tupperware and microwave at 50% poer for about a minute and a half. My boyfriend will fall in love with these! I think I'll add mushrooms or green pepper instead of broccoli! Thank you so much for the recipe! Can't wait to give it a try! I TOTALLY loved this idea and tried it myself. I am not the greatest cook in the world so i ran into a few problems but over all these were SOOO good. I also didn't cook them with broccoli (as I wanted my boyfriend to at least try them. )I also wrote a post about it on my blog and put a link referencing your blog post for the recipe. (let me know if thats not ok.)Thanks!!! Katy – I'd love for you to share the recipe with your readers. Please link directly to my post and include "Recipe by Anna Berman of Snacking in the Kitchen" Happy cooking! i wonder if this would work with egg beaters??? Just tried them with veggie sausages and yep, they were delicious – but I didn't grease the tin and they stuck! Silly me! I made these for Father's Day brunch after finding them via Pinterest. They were fantastic! We enjoyed these, but I had some issues with the measurements. I only used about 10 oz of meat, and I still went well over 12 muffins. In fact, I think I filled 17. But the egg mixture only filled about 10 of the muffin cups. And maybe I missed it, but I never saw that I need to grease the muffin tins, and these didn't just "pop" out. Regardless, they were yummy, but I think I will have to make a few modifications to make it work for us 🙂 Thanks for sharing! EP – thanks for your comment! You are right, I've omitted the oil spray part from the directions. I think my sausages had enough fat in them to keep the egg muffins from sticking. I did go ahead and add the step into directions. I wonder if you used a smaller size of a cupcake tin – this might explain the leftovers. Anyone tried making up the mixture the night before? This is the post that keeps on giving 🙂 I'm so glad it has brought so many of you to my blog. Yes, you can absolutely bake these "muffins" and freeze them. I'd recommend thawing them out in the fridge overnight and reheating in the oven. You might want to sprinkle them with extra cheese. These are very similar to my moms! She adds mushrooms sometimes! Yummy, will pass along!! She also puts croissants in the bottom and then the filling on top. Super delish! Yes! You can definitely make the mixture ahead of time. But I would recommend keeping the eggs and the vegetables/sausage separately. Let me know how they turn out for you! Thanks for sharing this!! I just made my own version with bacon, egg and cheese and it worked perfectly. The fam LOVES them! Woohoo!!! Now that I know they are a hit,I'll be making more to freeze. WHOOP! Thanks again! These look great! I've been looking for a high protein breakfast option and these look delicious! Thanks for the recipe! This recipe is great. I found it via pintrest of course and it was perfect. I also blogged about it today on my blog http://www.cookieandclaire.blogspot.com. Come by a visit if you have time! i want to try this recipe but i don't really know what Italian sauce is. Do you mean this? http://allrecipes.com/Recipe/homemade-italian-sauce/detail.aspx Sorry but I'm not from the US so I'm not sure what i need to use. These were fabulous! I made ours with canadian bacon, green onions and cheese. Thanks so much for posting the recipe! Made these this morning, easy and yummy. I made these for a baby shower bunch I threw. They were a great compliment to the waffle buffet! I even made the meat mixture the night before and sprayed the tins and put the mixture in, and covered it and put in fridge. Then it was easy peasy in the morning – just whipped up egg mixture poured it over, topped with cheese and baked! VERY GOOD!! Thanks! Jennifer! Thank you so much for catching the error – I can't believe I misspelled sausage. Sad funny :)Jeni – I love the bacon and cauliflower combination. Sounds amazing.Everyone else – thanks so much for all the love on this post! I made these this morning for brunch after my son's baptism. They were perfect! So yummy. I had to go to 3 different places to find ground Italian sausage- can you believe that?!? But so worth the trips! I'll be making these again and again. Thank you! Do you think this could be made in the crockpot? I have a brunch following my Grandson's baptism in a couple of weeks and I need something that will either cook while we are in church, or that is fast when we get back. Mrs. T. – thanks! you could always just add a sprinkling of red pepper flakes to your version for some extra heat.Jennie brooks – where do you live? I didn't expect Italian sausage to be a problem 🙂 Glad you went through the trouble of finding it and happy that it was worth itMitzi – definitely do not make these in a crockpot. You could make them ahead of time, freeze, and reheat before the event. Found your recipe/blog through Pinterest. These were quick and easy to make…and turned out great! Next time I'll add i more veg and less meat, I think. Off to peruse the other recipes you have posted. These worked fantastic for me! I used ground sausage, chopped bell pepper and chopped onion, added my egg mixture and used a pizza blend shredded cheese for the top. I took them to a brunch party and every one of them disappeared. Thank you for sharing the recipe! Yum 🙂 I'm definitely going to make these tomorrow morning, even if it means waking up earlier. But food is always worth it. Found your recipe on Pinterest and I had a question, Is the baking powder required? I just threw these together as a test run before planning it as a breakfast. I forgot to add it to the mixture, and just noticed I am out. What does the baking powder in this recipe?Thanks! These are great if you make and then freeze them and then you have them on hand for overnight guests, etc. These were excellent! I added a little oregano instead of salt & pepper. Great flavor everyone was impressed. Although even with greasing the pan with butter, they were still didn't come out great.I also made a batch with deli ham/turkey and some finely chopped cauliflower, topped with shredded cheddar for the kids. No one seemed to notice the cauliflower. To that pan, I added oregano and powdered mustard. I also accidentally added a little more oil and those didn't stick as much as the other ones did. I made these for breakfast this morning and they are definitely something I will try again. I made some with sausage and pepperoni (not a huge hit) and some with onions and bell peppers (everyone loved these). I also put shredded cheese in all of them. Even though I sprayed the muffin cups, they still stuck. Using the muffing tin is an awesome way to use different ingredients at the same time to experiment without having to make several batches. i finally got a chance to make these. i made them, then froze them for my husband and i to take to work in the mornings. perfect! now i'm planning on switching out the broccoli and trying green peppers and maybe do some mushrooms, too. thanks!! Made these last night and we LOVED them. I didn't have any sausage or broccoli so I used yellow and red peppers and onions along with bacon. Love the way they come out light and airy…must be the baking powder? And the taste is so wonderful. I had cold leftovers for lunch today and they were just as good. Are the veggies cooked in this recipe? If not, do they get done all the way just through baking? Looking forward to trying these this weekend! I found these on Pinterest (like many others!) and made some this afternoon. They look delicious! I used chopped spinach and added a little onion powder. Hoping to freeze them for quick breakfasts in the morning. Thanks for the recipe! I also found these on Pinterest. I made a double batch and already have them in the freezer! I used some Jimmy Dean sausage and Egg beaters and added red peppers, onions, spinach, and cheddar. I also added black pepper and red pepper flakes. I like a little spice! Hoping to grab & go in the mornings on my way to work. Thanks for sharing! this looks sooo yummy.Going to use this recipe on an upcoming event. Has anyone tried these using mini muffin tins? Need to take a breakfast item for a brunch next week (about 30-40 people). I'm thinking just decreasing the bake time? LOVE LOVE this idea! I'm going to try it with spinach instead of broccoli! Thank you! do you think these would freeze, and thaw well? Found this via Pinterest and seriously…they are so good! I made a few changes: spinach instead of broccoli and sharp cheddar cheese instead of parmesan. I had to leave out the baking powder because I didn't have any, but they were just fine! For my oven 15 minutes was the perfect baking time and I didn't have any trouble getting them out of my cupcake pan (sprayed liberally w/ Pam.) Thanks for the awesome recipe!! Made these today and they are delish! Substituted the broccoli for frozen spinach (just cooked with the sausage until thawed) and added sriracha for some extra heat. These would be great for the morning of a long weekend family reunion after dinner the night before. Everyone could make their own mixture with leftovers from last night's dinner! Thanks so much for the recipe. I found it on pinterest and it's in the oven RIGHT NOW. Can't wait for breakfast for dinner! What about trying to use Salsa instead of the whole veggies? Think it would make it too watery? I made these this morning. They were a hit with my roommates. They were good and easy to make. (and when I say easy-I mean it- because I don't cook much.) Anyway, the only thing I would do differently is cut the broccoli into smaller pieces. Thanks for the recipe. I made this recipe this morning and my roommates loved it. It was really easy to make and tasted great! I wish I would've cut the broccoli into smaller pieces, but it still tasted great. They should work just fine in a mini muffin tin. Definitely decrease baking time. I'd also recommend cutting the filling ingredients into a small size. Good luck! You are welcome! I'd recommend sauteeing the spinach first and squeezing all the water out before adding the spinach to the egg mixture. Yes! They freeze, thaw and reheat really well. You are so welcome! Thank you for trying and sharing your comments. Hope you come back for more recipes and ideas. Good luck! Your kids are going to love these. I LOVE Sriracha! And I love the idea of "make-your-own". Thanks for sharing your comments and I hope you come back to the blog for more recipes and ideas. I would recommend you stay away from salsa. You are right, the salsa will make the egg cupcakes too watery. You can use pico de gallo instead for similar flavors. You are welcome! Thank you for trying the recipe and sharing your success. Hope you come back to the blog for more recipes. I'm not a cook… do you have suggestions for reheating them? Toaster oven maybe? I've been looking for yummy, healthy, quick breakfast foods to bring to school with me, and these look delicious! Yes, you can absolutely reheat them in a microwave (30-45 seconds). For best results, reheat them in a toaster oven at 350, maybe sprinkle with some extra cheese. Be sure to check the blog for more creative and easy recipes. Let me know how this one works for you. These were really quick to make. I did not have brocolli so used a bit of red pepper for color. Added quite a bit of cheese which I think made them stick a bit. I'll reduce the amount of sausage or, better yet, use bacon or ham next time but only because I don't care for sausage. Hubby loved them. Lots of possibilities for additions/substitutions. Will make them again for sure. So good! My hubby and I just ran a train on these gems! have you tried to freeze these and then reheat them? I was wondering how these would taste after being frozen. Thanks for the great recipe! I took it to an office breakfast meeting and were a big hit! I'm wondering if I could prepare the muffins and then bake the next morning. Do you know if this would work? I can't wait to try this! I have a pancake recipe I make using my muffin pans and they are great to make on the weekends and freeze and then heat up a few for my son for breakfast on school days. I'm going to try to make a big batch of these and try freezing them and then heat them up on school days. Thanks so much for the great idea!!! I would definitely like the pancake muffin recipe too! I have made these twice and they are delicious. I first used link sausage as that is what I had in the freezer. I had 12 so I cut up one for each of the muffin cups. I added a generous pinch of shredded cheddar cheese besides the parmesan. My problem, even with generously greasing each muffin cup was sticking. I will try metal muffine liners next time. Well workth trying. We were out of any type of sausage and broccoli, so made mine with pre-cooked bacon bits, shredded cheddar, and I chopped up leftover roasted potatoes with onions and bell peppers from last night. They turned out good but they stuck a little. Next time I will make sure I have all of the ingredients so I can make it your way. Thanks for the great idea! I made them – I loved them – I froze them, and they still tasted great! I cooked them, then let them cool about 15 minutes- ran a knife around the edges and not one stuck! These were delicious! I made a big batch that I'll freeze and pull out as the kids want it. Thank you for a great recipe!! I made these tonight for breakfast tomorrow. They are so good! I used spinach instead of brocolli. And I made them in my mini cupcake maker! I never, ever, EVER cook…and I am making this right now. Can't wait to eat it! Do you bake them, cool them, wrap and than freeze? And do you warm them up in microwave, how long? Has any body tried that?? I make a version of this every Sunday afternoon, I use what ever veggies and meats I have left over from the week and as I am always dieting, I use egg beaters instead of real eggs. I also just ppour it into a baking dish and cut it into squares if i am out of muffin cups. I found you on Pinterest and I just made these, took them out of the oven 5 minutes ago. They are SO delicious! I made 1/2 the batch with eggs and cheese and either Bacon or sausage, they puffed up so beautifully! The other half I made egg white and sausage. Such a fantastic idea, thank you so much!! And the egg whites? Only 3 weight watchers points for 2, awesome!!! I just put mine in the oven…look so good! Can't wait to try them out! I just made these for lunch today (snow day!) and they were wonderful! My husband and son suggested I make them every morning! Might have to try making a big batch and freezing them. Me, too, would like to have your pancake recipe for muffin pans. I saw this on Reluctant Entertainers FB page, and am baking them right now! I never have time in the morning to eat, I leave so early. These will be great to take to work and warm up! Thank you for the inspiration!! I just pulled these out of the oven and they look delish! Super easy and versatile. My toddler son will love them too. Thanks for the great idea! Mine stuck to the pan as well. I sprayed them liberally… Anyone find a solution to this? If you spray them and they still stick try adding butter to the egg mixture and put a dab of butter on the bottom of the pan. They are baking as I write and smell delicious can't wait to taste them! Thanks for the recipe. You are welcome! Glad you found the recipe. How did it come out for you? Thank you! They freeze really well. Best to reheat them in the oven with an extra sprinkling of cheese. They freeze great! I like to reheat them in the oven with the extra sprinkle of cheese, but if you are in a hurry, microwave works fine as well. Welcome to cooking 🙂 How did they come out for you? I have so many simple recipes on the site, I hope you give a few more of them a try. How were they? I hope you loved them. You are welcome! I hope you are going to love them. Found your blog and this recipe through Pintrest and made it this morning for my in-laws visit. I made some changes1) i used the mini cupcake pan ( my normal sized is too old to use without a liner) – and the recipe yielded 48 mini egg muffins – soo cute too. I made half with broccoli and half without.2) One one pan i used the cooking spray but i ran out of it and i had to use shortening on the other pan – it worked way better with the shortening, non of them got stuck and they separated from the pan so nicely. Recommend to use the shortening for greasing up the pans.3) it took 8 minutes to bake them in the mini cupcake pans, so it was really fast too!My mother in law wants the recipe now – that's a success in my book!Thank you! The only change I made was I did use muffin cups. Perfect! So perfect, they are going to be our grab and go dinner tonight!! 🙂 Thanks!! These sound wonderful and I cannot wait to try them. Can you tell me if the veggies are cooked first? Thanks for sharing this. I made these with bacon instead of sausage, cheddar cheese instead of parmesan and added mushrooms. They were DELICIOUS!! Its definitely one of my new favorite breakfast recipes! I used turkey sausage crumbles, spinach and mushrooms. Husband can't get enough. Thanks for the recipe! Oh, and if you're on WeightWatchers, each muffin is 3 pts. Bonus Jonas!! Trying today with Bacon, Deli Turkey and Cheese. In the oven right now and can't wait to try them. Hope they don't stick. Read all the posts after I put them in the oven. These look delicious. Can they be made ahead of time and frozen? Do you think these could be frozen if I made a bunch of them? Yes, I briefly cooked the vegetables. Depending on your preference, you can throw them in raw. If you are using spinach or mushrooms, do cook them first because they have so much liquid inside. Did they stick? I hope not! Hope you loved them. Absolutely! They freeze well. Reheat them in the oven with an extra sprinkle of cheese. If you are in a hurry, microwave works well. will be trying in the morning! what a wonderful idea! Made it this morning, but I cooked it in a small baking dish instead. Used regular sausage (wished I had some hot sausage), added onion, and a handful of mozzarella, 89it was yummy. Did stick a little and i used Crisco, wasnt too bad. Had to add a little extra cooking time. We will definitely keep this recipe. Thank you. Found your recipe on Pinterest and it was great. Froze a bunch of them to reheat for easy breakfasts. Thank you for sharing! After looking at this recipe for a week, I made them tonight. Used spicy sausage, green peppers and mushrooms because my family (husband) won't eat broccoli. All ingredients were on sale in the last week, so cost per serving was abou $.55. I made a double batch and will freeze some. Then take to work for breakfast for a reheat in the microwave. I baked in convection oven in stoneware muffin pans and I did need a few extra minutes. Definitely using a good non-stick pan next time, my old pan went straight in the trash after this. 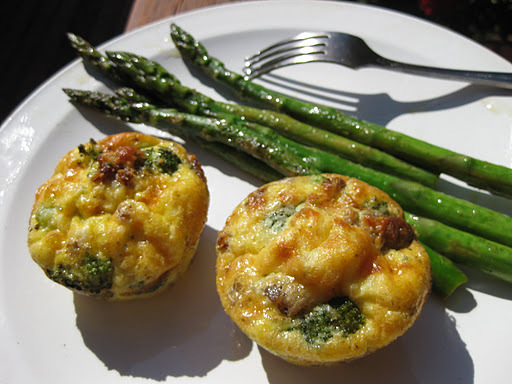 The egg muffins were very delicious I'll be making these again. That's a fantastic combination. I'm so glad the recipe worked for you. It is quite affordable and delicious – can't beat that! Thank you! Have you had a chance to try the recipe? Thank you! I am so happy you enjoyed the recipe. Let me know if a non-stick pan works better for you – I am sure it will! How would you defrost these? I would love to make some and freeze for a quick breakfast. Just made these with my 2.8 year old. He helped stir the egg mixture, put the meat mixture in the muffin tins, and topped them off with the cheese. We sat in front of the oven and watched as his the muffins "grew" (while singing songs). He was so exited to eat something he made. "See that mommy… I make muffins!!!". They were delicious!!! Didnt have any trouble with sticking as I moderately sprayed the muffin tins with cooking spray. A recipe definitely worth keeping. Thank you! Best comment ever! No joke 🙂 Thank you so much for sharing. They defrost very quickly. You can pull them out a night ahead and keep in the freezer and they'll be ready for you in the morning. Reheat in the microwave or in the oven. Perfect for breakfast-on-thego. Absolutely! Thank you for giving this recipe a try. my friend made these today for us, and they were amazing! can you freeze and reheat later?? Made these this morning. Husband loved them. Thank you for the wonderful flexible recipe. I plan to add garden bounty depending on what is mature. Great recipe! Thank you! Garden bounty would be fantastic in this recipe. You are welcome! Why no greens? Did you use something instead? You have an amazing friend! Lucky you. This is one of my favorite comments! Thank you for sharing my recipe with your students. I hope they discover the passion and love for cooking and enjoy it for many, many years! These are great!!! I used 5 eggs and 4 whites to lower calories and only used 1/2 lb of sausage and they are fantastic!!! I'll definitely freeze some for DH and me for a quick morning breakfast! this sounds yummy but I'll have to make it kosher…… no meat & cheese together. Soy cheese is a good substitute for this & lactose intolerant people. Put a biscuit on top, they are super yummy that way too. We have made these for years and years. Always a big hit! I can't wait to try these. My family will love them. Thanks. I had pinned this to my Pinterest site a couple of months ago. Tried them for the first time this morning. They were easy to make, looked exactly like the picture, and tasted AMAZING! I'm going to try chopped ham and sauteed mushrooms, with cheddar cheese, the next time I make these. Thanks for a great idea. Sure are! Did you love eating them? Absolutely! Or try a vegetarian version with mushrooms, broccoli and aspragus. And honestly, you'd probably be just fine leaving off the cheese! Would love to hear your feedback. Is it possible to use cupcake liners instead for a fun pop of color? What do you think? I do make them and freeze them so my husband can have one on the go ech morning (he is military and sometimes it just easier to be able to heat one after pt in the morning, and this recipe was awesome thanks!! I also discovered the recipe on Pinterest, and I made these last night for supper and they are delicious! Even my picky husband told me they are delicious. They also reheat really well. Thanks for the recipe! Found this on Pinterest, and I am eating one while I type this. Delicious! I left out the meat and cheese, and mixed in broccoli, red pepper, and spring onions; next time I will splurge and leave in the cheese. I'm thinking about a spinach, caper, feta version. Thanks so much! Jackie, how do you reheat? Just leave in the fridge to thaw, pop it in the microwave??? I'm expecting baby soon and I'm looking for freezer meal and breakfast ideas. I was thinking I could freeze these but wasn't sure how to reheat! I am hosting a bridal shower next weekend and thought this would be perfect for brunch. I was wondering if I could use this recipe and adapt it to make a casserole. Any suggestions? I've done that with a similar recipe, and they stuck to the liners. Do you use raw broccoi or cook it first? These look wonderful! I'm looking forward to trying them. Pinned this last week and just made them this morning – AMAZING!! I've already planned to make a whole bunch of these on Sundays for the all of us to eat during the week once school starts up. Thank you so much for posting this! I was only thinking of giving my mom this christmas hampers australia that I saw in Tesco. Not that she is so into laundry more often than any mom there is. But after seeing that fantastic recipe, oh boy, how can I think of anything else now, eh? I'm doing the same thing. Much better than sugery cereal for the kids! fyi- mushrooms have a LOT of moisture.. would be a good idea to dry saute (in a pan with no butter or oil) until they release their moisture. They make funny squeaking-squealing noises,this is normal. I learned this trick from another recipe. Two thumbs up from our family! I used ham instead of sausage and cheddar & mozzarella cheese instead of Parmesan as that is what we had on hand. Do you use sausage in cut into small pieces or bulk sausage without casing? I found this on pinterest… I made it with sausage and cheddar cheese. Oh man are they delicious! I have so many ideas floating through my head of what to add next time. For pancake muffins all you do is make up pancake mix like you would for pancakes, put some sausage on the bottom, or blueberries, or mix in some mini chocolate chips. and then pour mix into greased muffin tin and bake at about 400 until they are done. Hi, am wondering about the broccoli you use. I saw a few people ask, but never found an answer. Is it raw, cooked, frozen?? Can I mix up the night before, and cook in the morning? I am the worst cook in the world and brunch is at my house in the morning. Yikes! Any help is appreciated. I made these the other day for Sunday brunch, and as to be expected, they were absolutely delicious!! I'm excited to try out the different variations that were mentioned in the below comments. My only issue was that I definitely didn't spray enough oil onto the muffin pan…the poor egg muffins stuck to the sides and it took me ages afterwards to clean the pan. Either way, lesson learned! Thank you! I'm glad you enjoyed them. Please let me know which combinations you try. I used raw. I like it somewhat crisp. But you can definitely pre-cook yours if you wish. Cool them first in the refrigerator and then place in freezer safe ziploc bags and freeze. Hi Jennifer. I would recommend making the vegetable and sausage "filling" the day before and the eggs. Combine the two together right before baking. Good luck! I'm sure are going to love these. 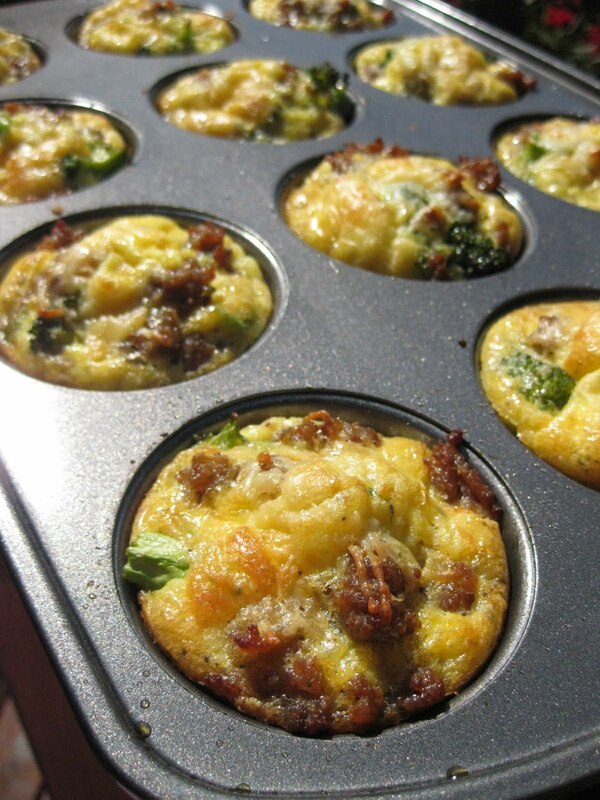 People have some difficulty removing the egg muffins from the muffin tin, so be sure to grease really well. How did they reheat after freezing? Any problems with texture? my thoughts exactly!! I am going to try this with these ingredients. I made these with Italian sausage, spinach, mushrooms, and cheddar cheese. Very tasty! Wow this sounds great! I have been doing the cooking for mom since her operation. I wanted something different to offer her. Thank you so much for this idea and options are endless! Great recipe! I'm no cook but they inspired me to try some mini ones with spinach instead of broccoli and they turned out pretty good. Thanks! These were great and my husband who is normally a picky eater loved them. He said they were excellent! I love that this recipe lends itself to lots of variety . Use up what you've got in the fridge. They reheat well too. I’m making them for a school breakfast ill let ya know if they were a big hit which no doubt they will be!! Pingback: Sunday Funday……….! Breakfast Ideas.. | Let's Try Creating...! Pingback: 10 Fabulous Mother's Day Recipes! Puffy is good, but not if they overfloated in the pan. I’d check to make sure you used the right amount of baking soda. baking soda or powder? Someone above asked if you could use thawed frozen broccoli, but I couldn’t find a reply? Thank you for your question, Dawn! I wouldn’t recommend using frozen broccoli in this recipe. Frozen broccoli has a lot of water in it which will make the muffins soggy. If you only have frozen, I’d suggest thawing it ahead of time and patting it dry to remove any extra moisture. The recipe calls for baking powder. Enjoy! I’m so glad you are going to give these a try. I’d suggest prepping ahead but baking the day of so they are hot and fresh 🙂 Would love to hear how they come out for you. Hi Anna! 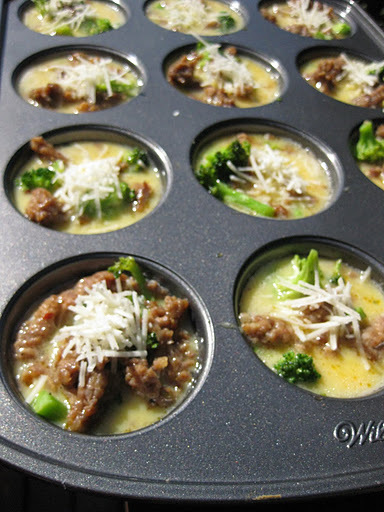 I made these this morning (had everything except the egg mixture prepped in the pan ready to go the night before- I par cooked the broccoli a little since I was making minis) and they turned out GREAT! People who don’t typically care for egg dishes ate them up and asked for the recipe! Thanks for the recipe and I’ll definitely make again. I made 48 mini muffins (24 sausage and broc and 24 ham and cheese) and there were only 6 left! I make these constantly and love them. Have you tried this in a dish instead of muffin tins? I have an upcoming function and I like to take a “casserole” instead of individual muffins. First of all, so happy you’ve enjoyed the recipe to make it multiple times 🙂 What’s your favorite filling combination? I hope you saw a post I recently added for Quinoa, Chicken, and Zucchini Egg Bake. It’s similar to this recipe, and I do bake it in a glass Pyrex dish as a casserole. You can certainly do the same with these muffins. Check on the time though, the casserole may need a few extra minutes of baking time. Please let me know how this works out. If you’re on instagram, please add your photo and tag @snackingkitchen. Happy cooking! I was wondering if the broccoli should be fresh, frozen or steamed? Great question! You can do fresh, or steamed, or sautéed. I wouldn’t recommend frozen because it’ll release out too much liquid. Enjoy! Would love to hear back what you thought about the recipe. Made these this morning. They turned out great. I had Gastric Sleeve surgery and these are totally bariatric friendly. Family loved them. Tried these this morning and both my husband and I loved them! I used ham, broccoli, green onions and mild cheddar cheese. I froze them and will be taking them on an upcoming trip for a quick breakfast. Thank you for the GREAT recipe! Thank you so much for your feedback, Jamie! Happy to hear you loved the recipe. It’s a great base for many variations! I never quite expected so much love for these egg “cupcakes”. So happy you all love them! Mine were all gone at brunch, so there were none to reheat.